Vietnam is very densely populated. With most of its 90 million people living along a narrow coastal strip, it's all too easy to experience the country through a blur of exhaust fumes, struggling along Highway 1 and stopping off at the most popular towns and cities along the way. As it's a lot to take in, you would do well to factor in time away from the mainland, on one of the country's beautiful islands that are fast attracting visitors. In the north, the Ha Long Bay area has more than 2,000 craggy limestone islets, but you need to choose your boat trip carefully as the Unesco-listed region is wildly popular. So it's worth investing a little time to explore the less-visited, outer islands. Off the central coast, the Cham Islands are a great day trip from historic Hoi An, while in the deep south, Phu Quoc is developing fast but has a lush interior and unspoilt beaches. 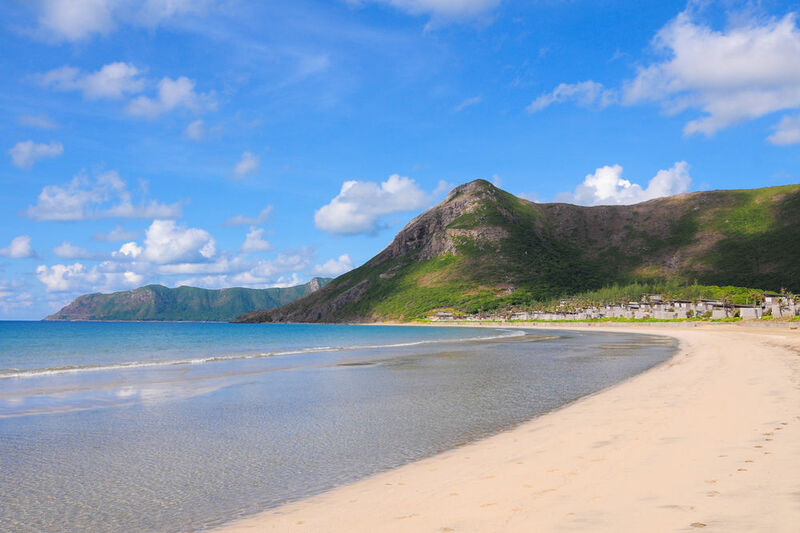 For the ultimate escape, however, my pick would be remote Con Dao, with a fascinating history and empty beaches. The Con Dao islands have an utterly unhurried ambience. "There are two traffic lights, but no work," the bike rental guy said apologetically as he gave me the island rundown. "One gas station, but close for lunch. Only one road, so you no lost. Right to airport or left to prisons and port." Moped key in hand, I was relishing the chance to get out and explore some empty roads in search of a perfect beach for the day. I'd spent the previous week embracing Vietnamese city culture and its furious energy and commerce, but was now in need of some serious hammock time. A cluster of 16 islets in the South China Sea, the Con Dao islands are 250 kilometres from Ho Chi Minh City. Only the main island, Con Son, is inhabited (its population is just 6,000), though the other islands can be visited. Once hell-on-earth to thousands of prisoners incarcerated by French colonists and the American military, today the Con Daos are blissfully tranquil. With their ravishing sandy bays, rainforests and healthy coral reefs, their tropical appeal is easy to grasp. Flight connections used to be atrocious, but Vietnam Airlines now offers three daily flights from Ho Chi Minh City. The rental guy had lied about the one road. Easily sidetracked, my Honda and I had chanced upon a rough track close to the airport, and our inquisitiveness had rewarded us royally in the form of Dam Trau beach, a sublime half-moon crescent of pale sand, bookended by forest-topped rocky promontories. After an hour's snorkelling, exploring the kaleidoscopic coral teeming with macro life and spending five minutes swimming eye-to-eye with a hawksbill turtle, I retreated to the plastic chairs in the bay's seafood shack, picked a victim from the live fish tank and gorged on crab with tamarind and chilli. The only other diners were a group from Hanoi, employees of a state-owned bank on a corporate jolly-with-a-purpose. Ghosts are everywhere in Con Dao, nowhere more so than at Phu Hai jail. Built in 1862, it once housed 20,000 prisoners – political and criminal inmates chained together naked in rows. The really troublesome individuals were kept in 'tiger cages', with six to 10 men crammed into a tiny open-roofed enclosure, beaten with sticks from above and dusted with lime and water (which burns the skin). Unbeknown to the world, the Americans continued operating these tiger cages until 1970 when a Life magazine report broke news of their existence, provoking an international outcry. It had been a chastening day, the brutality of prison conditions contrasting acutely with the overwhelming beauty of my surroundings. As I strolled along the seafront promenade in Con Son town, it was easy to marvel at the sheer gentility of this pocket-sized island capital, its litter-free streets, French-era villas, well-kept municipal buildings and air of calm and prosperity. The next day I dropped by the National Park offices just outside Con Son town. The islands' ecosystems are unique, with 11 trees found nowhere else in the world. It's thought that a dozen or so dugong, or 'sea cows', remain in the waters around Con Dao, though they are extremely elusive. You've a much better chance of seeing sea turtles as the islands are Vietnam's most important nesting ground. The World Wide Fund for Nature has supported conservation efforts to protect the green turtle, and national park rangers run night-time boat trips to neighbouring Bay Canh island (the main turtle-nesting season is May to November). I'd already been lucky enough to snorkel with a turtle, so I fixed up a hike with a ranger instead. Following a slippery but well-marked trail we entered the ever-dripping island rainforest, inching up a mountainside past giant creepers, roots and shoots, picking our way over colossal hardwood buttresses up to the long-abandoned So Ray Plantation, established by the French but now occupied by a sociable troop of long-tailed macaques which are thriving amid the fruit trees planted decades earlier. On my last day I hooked up with a Honda again for a ride south. Bicycles are also available for rent from hotels and taxis can be booked, though they are quite pricey. We hugged the coastline, buzzing past coves and beaches, the lonely road lined with wild bougainvillea and the curious aerial-rooted pandan tree. Towering granite cliffs cascaded down to a turquoise sea as we rounded Ca Map point before rolling into Ben Dam, a no-nonsense port preoccupied with the gritty business of Vietnamese life. Here sailors sell giant durian fruit from boats and their decks are crisscrossed with clotheslines pegged with drying seaweed, fluttering in the ocean breeze. I ordered a treacle-thick Vietnamese coffee from a cafe to fix me up for the return leg and paused to watch ruddy-cheeked, beer-happy men paddle from the shore in bizarre coracle-like contraptions back to their fishing boats moored in the bay. My final stop was Hang Duong cemetery. In the windy season, bones lie exposed in the sun here when the sandy topsoil is blown away. But today there was just the gentlest of breezes, on which drifted the smell of incense. Following the scent through the flowering scrubs and trees, I was guided to a specific grave, one of thousands there. Here I found the group of bank workers again, heads bowed, at the tomb of Vo Thi Sau as prayers were offered and thanks given to a national icon. I found myself contemplating the nature of the modern Vietnamese nation: the long struggle for independence and years of suffering, today's breakneck pace of development, the economic successes and the inevitable growing pains. Here in Con Dao, I enjoyed the silence. Rugged, mountainous Cat Ba island is emerging as a great base to explore the wider Ha Long region. Most of the island is a national park, with trails that fringe the habitat of one of the world's rarest primates, the cherubic-looking, but highly endangered Cat Ba langur. Cat Ba is also something of an adventure sports mecca thanks to pioneering work by Asia Outdoors, which has established dozens of climbing routes on the spectacular limestone islets that fringe Cat Ba, and also offers all sorts of kayaking and sailing excursions. In Vietnam you're never far from a reminder of the conflict locals call the American War. Cat Ba's amazing Hospital Cave was used by the North Vietnamese as a safe shelter for the military elite, and has its own operating theatres, a small swimming pool and even a cinema. Until a few years ago the Cham islands in central Vietnam were a military zone and off-limits to tourism. Times have changed and the islands are now accessible by boat trips (April to September only) from Hoi An. During the main Vietnamese holiday season (July and August) local tour groups can swamp the golden beaches, but after they've departed (around 2pm) normal service (peace) resumes. There's decent diving, though visibility can be challenging. Make sure to drop by the unusual little temple Ong Ngu in Bai Lang, which is dedicated to the whale and whale shark (regarded as oceanic gods by locals until a generation or two ago). In Vietnam's extreme south, Phu Quoc island is tipped to be the country's next beach hot spot. A new international airport opened in 2012 (daily flights arrive from Ho Chi Minh City) and dirt roads are steadily being paved. For now it's still possible to find a quiet place to escape the mainland crowds. Try eco-friendly Mango Bay or Itaca, which offers modern-Mediterranean and Asian food, hip decor, DJs and a chilled atmosphere. Break up the beach-hopping, if you can brave the smell, with a visit to the nuoc mam (fish sauce) factory in Duong Dong, the main town. This article was written by Iain Stewart from The Daily Telegraph and was legally licensed through the NewsCred publisher network.